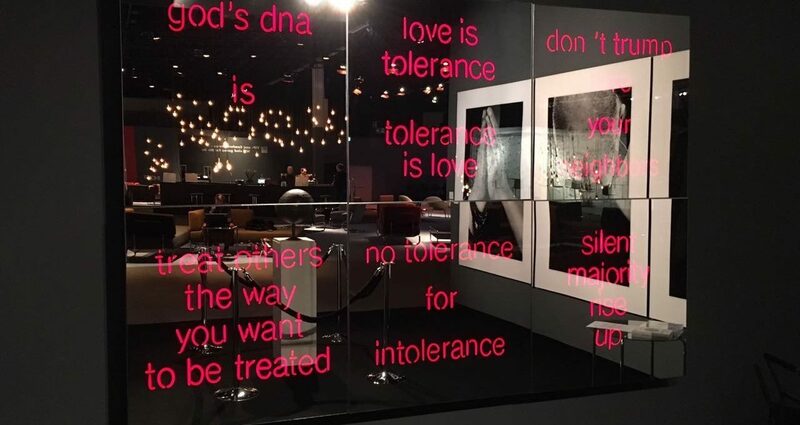 This video installation of six mirror boxes ( 90 cm x 90 cm) with red neon signs inside contains The Codes of Tolerance below. 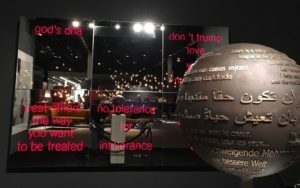 Hubertus Hoffmann uses red neon signs, plexiglas, a one-way-mirror, powder-coated aluminum, electronic light sequencer, and transformers for his political art project, promoting an active tolerance policy of the (still) too silent majorities against intolerances of all kind. The quotes are based on the book “Love is Tolerance” by Hubertus Hoffmann and include the wisdom of tolerance from all over the world. ” god’s dna – is – diversity” – “love is tolerance – tolerance is love” – “don’t trump – love your neigbors” -“treat others-the way-you want-to be treated” – “no tolerance-for intolerance” – “silent-majority-rise-up”. 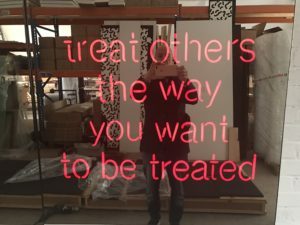 You look into a mirror and see yourself: Suddenly the red neon sign pop up, word by word, demanding you to think about the Codes of Tolerance. 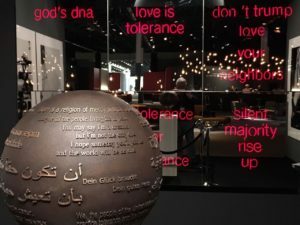 If you want to support The Global Tolerance Initiative and you are interested in our neon art, please write our team at info@loveistolerance.com.